The First World War had a decisive impact on the history of the 20th century. Many Kiveton men served during the First World War, in many theatres, from the Western Front and Gallipoli to the lesser known conflicts in the Middle East and the Baltic. These conflicts impacted upon the villages of Kiveton Park and Wales in many ways. Many paid the ultimate sacrifice and lost their lives; others survived but their experiences were to stay with them for the rest of their lives, as many of the accounts here demonstrate. When war was declared in August 1914, there was a rush to join up across Britain. Men were fuelled by both the sense of duty for King and country that had been nurtured in them since boys, but also a sense of adventure and excitement, to serve and fight against the foe was a dashing experience that would make them men – such ideas had been packed into the adventure fiction picture books and stories many would have been raised on. The reality was to be much more grim. At the St. John’s Rooms on that fateful day on 2nd September 1914, recruiting sergeants cajoled and encouraged men to join up, even distributing tots of rum to induce confidence. George Louder’s brother-in-law Lance not only refused to join because he had a wife and children to look after, but tried to persuade George not to go, even in front of the recruiting Sergeant who wasn’t too happy, according to a family story passed down, that Lance had drunk the Sergeant’s rum with no intention of marching to war. 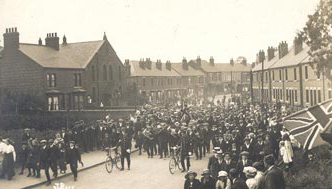 Just 3 days later on Saturday 5th September 1914, 89 new recruits paraded through the village from St John's rooms to Kiveton Park station (Kiveton Bridge station did not exist yet!) headed by a band and accompanied by family and friends. The moment was captured by local photographer, Joe Bass (above). Several men from Kiveton and Wales were already fighting in France when these volunteers joined up, including Grenadier Herbert Barks, a member of the British Expeditionary Force who died during the Battle of Aisne on 14 September 1914 – the very day it is considered trench warfare began. The new recruits served in an assortment of regiments due to the location of Kiveton and Wales at a point where three counties meet. Chance and circumstance seem to have largely determined which regiment the volunteers ended up in. They fought across the world, in an extensive number of regiments unusual for a village of this size. The regiment they joined made for very different wartime experiences and fates. Walter Blackwell and some others joined the Lincolnshire Regiment but found themselves with the Notts and Derby Regiment, otherwise known as the Sherwood Foresters. Others joined the Yorks and Lancaster Regiment and were killed alongside hundreds of other Sheffield Lads on the fateful day of 1 July 1916, when the battalion attacked the fortified village of Serre on the first day of the Battle of the Somme. All those who served would have received campaign medals; usually awarded in trios or pairs. Trios would be made up of the 1914 or 1914-15 star (for those who served overseas during those years but were not warded together), the British War Medal and the Victory medal (left to right). These were affectionately known as ‘Pip, Squeak and Wilfred’. 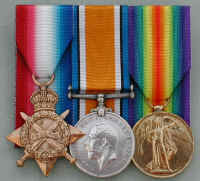 Pairs were the British War medal and the Victory Medal, generally for those who served after 1915, and in this case were known as ‘Mutt and Jeff’. In addition, to the campaign medals some of the local men who served were decorated for various acts of bravery. Temporary Captain Bernard Hill Horsley of Springfield Terrace, Kiveton Park was awarded the Military Cross for ‘conspicuous gallantry and great power of leadership’ during the Somme offensive in July 1916, during which he sustained severe wounds. The Military Cross was only awarded to commissioned officers (ranks of 2nd Lieutenant and above) and up until 1917, to be an officer in the Army it was necessary for you to have attended an approved school. Several local men of lower rank were awarded the Military Medal for gllantry, including Frank Hydes and Frank Miller. For details of cemetaries and memorials abroad which is where most of the men who died are buried, please see the Commonwealth War Graves Commission site. If you want details of service battalions and campaigns, we suggest you look at the excellent site The Long Long Trail. Many WW1 army service records were destroyed during the blitz of WW2 so it can be difficult to locate details of many who served and we have scoured local nespapers for many of the details recorded here. 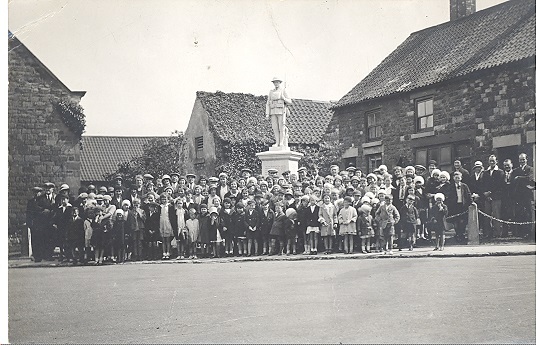 The Memorials in Kiveton and Wales. We know that during the conflict there were 3 ‘War Shrines’ erected, one in Wales Square but we do not know the exact location of the others (one was Waleswood, the other Kiveton Park). As the majority of men who died were buried near where they fell (or the body never found), in the absence of a local grave, these provided a place where people could remember their loved ones, and appear to have been a temporary measure until more permanent memorials were erected after the war. We know from newspaper articles that the Ladies War Sewing Party were the driving force behind the development of the sites, and that Mrs Clarkson, whose son David was killed in the conflict, did a lot of work to ensure they were maintained. The villages have several sites of memorial, the most prominent being in Wales Square. 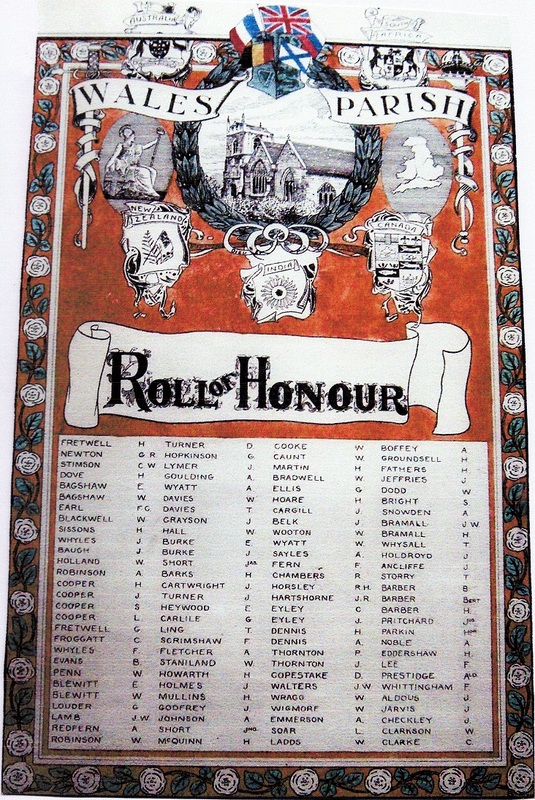 In St John’s Church at Wales, there is a Roll of Honour which details those who served, so includes men who returned as well as those who died. 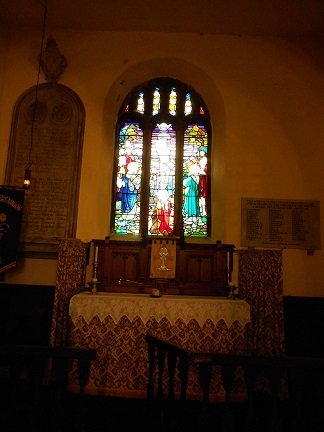 There is also a memorial window in the church to commemorate the fallen. Likewise, the Wales United Methodist Church also has a roll of honour and memorial window. Lastly, there is the Colliery memorial which is dedicated to those men who died and were employees of the Kiveton pits, so this includes many names of people from surrounding villages who worked at the colliery. The names recorded on these memorials are listed here, and you can find further details of individuals in the ‘Those who served’ section using the filter by surname. Often names appear in more than one place, so for instance if the person died in the conflict, lived in the village, attended St John’s church and worked at the colliery, they could be recorded 4 times – on the Church Roll of Honour, the church plaque, Wales Square memorial and Colliery memorial. Someone who died but is named on the colliery memorial, was employed there but was not living in the villages of Kiveton and Wales. We are aware that there are some errors on this memorial, probably as a result of the company who made it not being able to read someone’s writing! Here the names are recorded as they appear on the memorial. Royal Navy Submarine L55: Abel Seaman A Clarkson. 20th Hussars: Pte J M Thornton. Royal Field Artillery: Corpl H Grounsell; Gunner A Goddard; Gunner C F Lee; Gunner F Tristram. Royal Garrison Artillery: Lieut H Marton; Corpl H Hawkins. Royal Engineers: Sapper H Knapton. Grenadier Guards: Pte W Baines; Pte W Fletcher. Coldstream Guards: Pte H Barks. West Yorks: Pte R Hall. Kings Own Yorkshire Light Infantry: Lce Corpl E Blewitt; Lce Corpl G H Lowder; Lce Corpl F Whyles; Signaller G Froggatt; Pte G Bailey; Pte H O Checkley; Pte L Cooper; Pte S Cooper, Pte J Fry; Pte G M Fretwell, Pte J R Hartshorn; Pte B Radford. York & Lancaster Regt: Serg B Barber; Lce Corp H C Parkin; Pte W Bagshawe; Pte W A Emmerson; Pte L Gregory; Pte T Hawke; Pte W A Lamb; Pte J Whysall. Army Service Corps: Pte J Hall. Lce Corp J R Whyles (Duke of Wellingtons) died from the result of the war 1920. East Yorks: Pte D Copestake; Pte W Hague; Pte S C Schofield. Lancashire Fusiliers: Pte W Williams. Scottish Rifles: Pte D Clarkson. W R Reg (Duke of Wellingtons): Pte A Froggatt. North Staffs: Pte F Mortimer. Notts and Derby: Serg C Eyley; Corp H Fathers; Lce Corp A Fearn; Pte H Howarth; Pte A Johnson; Pte H Sissons; Pte G W Bradley; Pte C Elliott. Machine Gun Corps: Lce Corp C Chambers. The Roll of Honour in St John’s Church at Wales lists the names of men who served in the war. They are not in alphabetical order, so may have been added in order of when the men signed up. The names are listed here as they appear on the original. 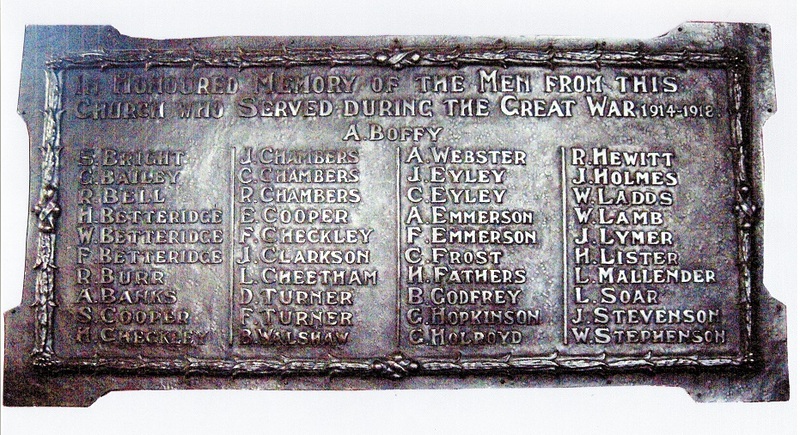 Those named are: William Henry Bagshaw, George Horace Bailey, Walter Baines, Bennett Barber, Herbert Barks, Ernest Blewitt, George Wild Bradley, Charles Chambers, Harry Osborne 'Os' Checkley, Albert Clarkson, David Clarkson, Lawrence Cooper, Samuel Cooper, Daniel Copestake, Clarence Charles Elliott, Arthur Emmerson, Cecil Eyley, Harry Fathers, Albert Fearn, Arthur Froggatt, Cuthbert Froggatt, Joseph Fry, Arthur Goddard, Harold Grounsell, Lewis Gregory, Walter Hague, John (Jack) Hall, Reginald Hall, John Robert Hartshorne, Thomas Hawke, Herbert Hawkins, Henry Howarth, Arthur Johnson, George Knapton, Albert Lamb, Charles Frederick Lee, Henry (Harry) Martin, Frederick Mortimer, Thomas Edwin Mozley, Horace Parkin, Bruce Radford, Bertie Scholey, Harry Sissons, John Milton Thornton, Frederick Tristram, Frederick Samuel Whyles, Thornton Whysall, William Williams. 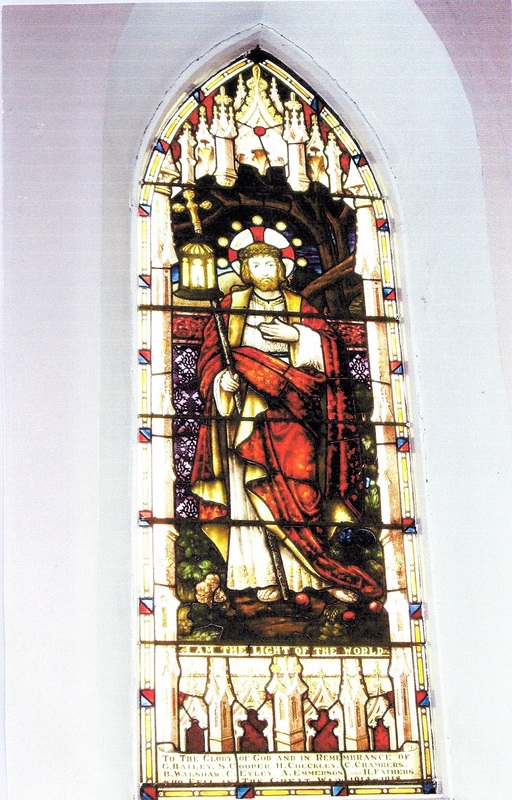 The church located on School Road at Wales had a roll of honour which names those from this church who served, and also a memorial window commemorating those who died. To the Glory of God and in remembrance of G Bailey, S Cooper, H Checkley, C Chambers, B Walshaw, C Eyley, A Emmerson and H Fathers who fell in The Great War 1914-1918. 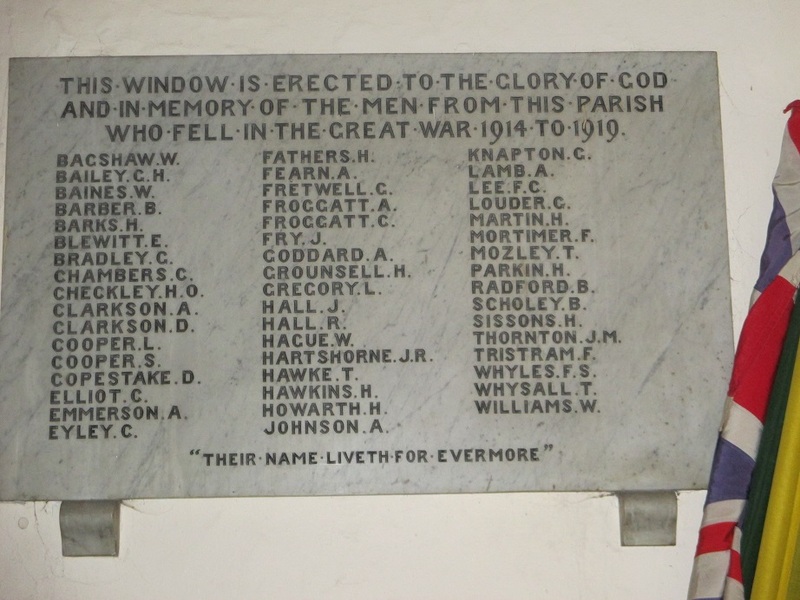 In Honoured memory of the men from this church who served during the Great War 1914-1918. A Boffey, S Bright, G Bailey, R Bell, H Betteridge, W Betteridge, R Burr, S Cooper, H Checkley, J Chambers, C Chambers, E Cooper, F Checkley, J Clarkson, L Cheetham, D Turner, F Turner, B Walshaw, A Webster, J Eyley, C Eyley, A Emmerson, F Emmerson, C Frost, H Fathers, B Godfrey, G Hopkinson, G Holroyd, R Hewitt, J Holmes, W Ladds, W Lamb, J Lymer, H Lister, L Mallender, L Soar, J Stevenson, W Stephenson. Frederick Adams, William Henry Bagshaw, George Horace Bailey, Walter Baines, Fred Walker Baines, Herbert William Bambrough, Bennett Barber, Harry Barton, George Wild Bradley, Lawrence Burgin, Charles Chambers, James Robert Chambers, Harry Osborne 'Os' Checkley, Samuel Cooper, Lawrence Cooper, John Robert Culley, Frank Drackett, James William Drackett, Henry Draper, Clarence Charles Elliott, Cecil Eyley, Harry Fathers, Albert Fearn, (Alan) Joseph Featherstone, Robert Featherstone, Arthur Fisher, Walter Fletcher, Harold Fletcher, George Marshall Fretwell, Cuthbert Froggatt, Joseph Fry, Herbert Gabbitas, Harold (Harry) Gay, Arthur Goddard, Lewis Gregory, Harold William Grounsell, John Robert Hartshorne, Thomas Hawke, Wilfred (Fred) Hayes, Joseph Hepworth, James Farewell Hobson, William Jackson, Richard Jones, Albert Lamb, George Herbert Louder, Frederick Mozley, Thomas Edwin Mozley, George Albert Northridge, Horace George Parkin, John William Scott, Harry Sissons, Albert Arthur Smith, W Thompson, John Milton Thornton, Frederick Tristram, Joseph Walker, George Waplington, Frederick Samuel Whyles, Thornton Whysall, William Williams, Percy Willis. During our research, we found details of almost 300 people who were involved in the conflict in some way! Our thanks goes to the many people who have provided stories, photographs and information; particular thanks for their research goes to Lance Wilks, Ian Hinks, Mari Godfrey, Betty Quinton, Peggy Whiteway, Eric and Sue Chambers, Cate Goodlad, Leri Morton and the Wales High School History Club. If you find there are errors, or can provide further information, please get in touch through the contact section.